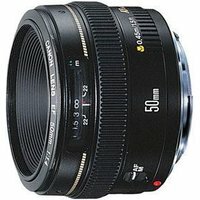 The Canon EF 50mm f/1.4 USM lens features superb quality and portability. 2 high-refraction lens elements and new Gaussian optics eliminate astigmatism and suppress astigmatic difference. If crisp images with little flare are important to you, they can be obtained even at the maximum aperture with this robust lens. Suitable for use with full-frame and cropped sensor (APS-C) DSLRs.